Posted by claireblang in 2009 Season, Drivers, Sponsors. The Chicagoland, Madison, Green Bay, Indy Tour! I’m taking a few days off in Wisconsin – as my sister is getting married in Green Bay this coming weekend. There’s a flurry of activity here – but it won’t involve the radio. For the first time since I can remember I am not doing “Dialed In” and will be off Wed., Thurs, and Friday of this week. I am headed to Indy early and staying in the Midwest since Chicago so I will return to “Dialed In” next Wednesday, LIVE from Indianapolis Motor Speedway. I always love covering the Brickyard – it’s something special so I’m looking forward to that. Right now though being spoiled by my mom and having meals made for me instead of coming home from a trip to an empty refrigerator. Can we ever get enough of our mom’s home cooking? The weather is so beautiful here – and it’s great for the soul to be home after so much traveling. I’ll tell you all about the wedding when I return…it’s turned into a huge affair with family and friends I haven’t seen for years and I’m so lucky that out of the blue, not knowing the race schedule, my sister picked an off weekend for her wedding, which makes it easier for my schedule. (IE: No leaving the reception to check out the race on TV lol) My sister has invited some of my friends from high school and so I’ll get to see friends that I have not seen in forever. I’m looking forward to it. Enjoy the weekend and I’ll catch you Wednesday 7-10 EST from Indy on the Midwestern tour! I still think that Danica Patrick is not coming to NASCAR. We’ll see her show up here and there. It will rouse suspicion and plant seeds but in the end, I think she knows what it would take to move into NASCAR and it’s a gamble for her. Almost everyone who knows the sport says that it would require starting out in the Nationwide or Truck series for a while….and I just don’t see her doing this at this stage of her career after what she’s accomplished in open wheel. However, stranger things have happened and it’s weird economic times in both NASCAR and Indycar. She’s a smart cookie. She knows what it would take. I know she visited Stewart Haas racing for a tour, something that was NOT kept hush hush. If she was thinking about it seriously don’t you think that it would have been a closed door visit – kept secret? I think she’s in the mix and wants to be just that- it’s smart for her at this stage-but as far as actually moving into NASCAR. I do not see it. Unless she gets an offer that she can’t refuse. I like Danica. I went to Chicago to interview her when she announced her “Go Daddy.com” Indycar sponsorship. She was really a lot of fun and I asked her all the tough questions, like was she really the ice princess that some said she was. She laughed and the interview was easy, as she answered everything I threw her way openly and fairly. She was actually very easy to hang out with. I met her mom and dad and husband and interviewed her folks as well. She’s really a pretty amazing woman. She knows what she wants and she is not afraid to go for it – for that she gets the reputation for being cold. I didn’t see her that way. I still don’t think she’s coming to NASCAR but whatever she chooses she’s talented and extremely marketable and whatever she decides to do she’ll be front and center. Brad K. would rather race and not spend his time worrying about where he’ll go next but he’s in a good position. I talked to him about his next move at Chicagoland. Keselowski: “Yea, You know I am working on it. Don’t have any answers on it – making progress. Things look good, they look very good for me to be back driving this #88 Nationwide car full time which is just as important to me as running the Cup series. So that’s all coming together nicely, not there but it’s coming together and I’m looking forward to it. CBL: What pushed you over the top as far as sticking around? CBL: What about selecting Martin Truex Junior…how heavily did you recruit him? Did you interview him? What was the role NAPA played in selecting him? CBL: What makes him your kind of guy? CBL: But Michael’s not that low key. CBL: Did you look at video tape, study driving performance records etc? CBL:And how to you see the landscape for sponsors? I hope everyone is enjoying the post July 4th summer fun! It won’t be long before we’ll be at Indy racing the Brickyard. I’m excited to return for the weekend to Green Bay where I have not been for so long I think I will need a road map to find my way around. Posted by claireblang in 2009 Season, Trackside. It’s raining at Chicagoland Speedway (2:25 p.m. EST) – Jet dryers are on the track but it’s iffy but possible we’ll sneak the Nationwide race in here. Everyone’s hoping that mother nature cooperates. “Dialed In” – is scheduled to be on the air from 7:00-7:30 p.m. EST tonight (Friday July 10) leading up to the start of the Dollar General 300 powered by Coca Cola. If the rain halts the race or the start of the race and MRN Radio throws it back to affiliates – then “Dialed In” will be on from 7-10 p.m. EST. I’m broadcasting from the Safety Clean Trailer in the garage here at Chicagoland Speedway. Saturday- Dialed In is on from 2:00-4:15 p.m. EST -leading up to the start of the SIRIUS NASCAR Radio pre race show at 4:15 p.m EST. 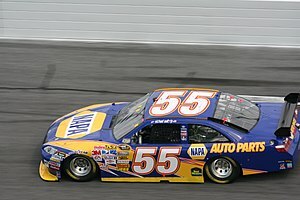 The MRN start of the Lifelock.com 400 is at 7:15 p.m. EST. After the race I’ll be LIVE in Victory Lane and on the SIRIUS NASCAR Post Race Show until 1:00 a.m. EST. More coming from the media center as it happens. I’ll be back with more during the rain delay and practice. Still raining here at Chicagoland.